WELCOME! This NAPHA Website’s goal is to document approximately 1000 defunct amusement parks in the United States and Canada. While most of the amusement parks were closed long ago, the site will include a few dozen operating parks like Kennywood, Cedar Point and Hershey Park that have had long interesting histories. Obviously researching and documenting these many parks will take several years and will require the efforts of many NAPHA volunteer historians to achieve the goal. Competition by a new park with a better location or better attractions. Death of the park owner. Fire destroys all or part of an uninsured park and the owner can't afford to rebuild. The 1930's Depression when there was high unemployment and little money available for entertainment. Cities and towns during the 1950's - 1970's that felt that amusement parks were honkeytonk and a blight on their community. They closed the parks via a variety of tactics. Building a highway through the amusement park rather than around it, just to get rid of it. There is a list of defunct parks by state and whether I was unable to find information on the Internet. A good source for information may be the local historic society for small obscure parks, some of the many Arcadia Publishing amusement park books, or more through history books for specific parks. If an article is finished, the link in the state list will be active. To begin with there are only ten articles as examples; Elitch Gardens in Denver, and Golden City in New York. The layout for each park’s history will consist of a researched and accurate text mixed with photos of the park’s attractions. These can be a mixture of color postcards and B&W photos. There will be a small clickable window for a park map, which will open a separate scrollable window to view the larger map; usually a Sanborn fire insurance map. Very long articles will be divided into historic periods. The project began when I acquired over 200 Sanborn Fire Insurance maps nearly 18 months ago. By comparing lists of roller coasters on rcdb.com and lists of defunct parks by state on other sites, the list grew to about 1000 lost parks. 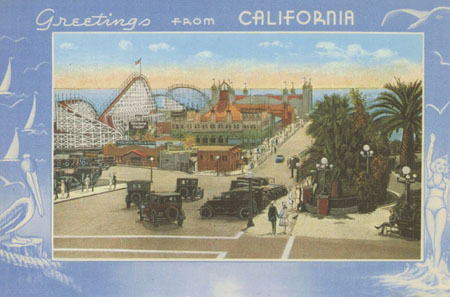 Of course there were several hundred other parks dismissed because, while they had a dance hall, restaurant, theater, carousel, bandstand and picnic grove, they never developed into an amusement park with a group of rides like a shoot-the-shoot, scenic railway, old mill, circle swing and assorted attractions. I also searched the Web and auction sites like E-bay and Cardcow for park images. Then when you write your article you can blend all your source material together into an informative article. Description of rides are very important. Be aware that you may find 253 articles, but most will just be the park in one of their park lists with the address and manager's name, or an advertisement seeking various concessions. Sometimes you do hit paydirt with an opening with rides, or ride additions mentioned. Perhaps one will find a park's opening ad. While Google books has digitized Billboard from 1943 to 1966, the missng years are currently only available on microfilm at various larger libraries. There is always a section on Parks (use weekly issue index). If anyone seriously looks at these issues, please take notes of the useful park articles that contain ride names. and the date they appear. Afterwards, please type it on your computer so it is a digital file and can be shared. This is not Wikipedia, so NAPHA members can’t go in and make changes. As head of the project, I’m the only one working on the project’s lost amusement parks library who has access to the server. Any articles, additional photos, corrections of text or captions must be submitted to me. You do not need to write .html code before submitting the article; just E-mail the text, photos, and captions. Jim Abbate is in charge the main Lost Amusement Park Page on NAPHA’s main Website and will control the park lists and links to the library side of the project. Remember to caption photos in the E-mail text. If you scan from printed material and observe a splotchy pattern (called a moiré), tilt the postcard or photo about 15 degrees and scan again. Of course you will need to straighten the photos afterwards with Photoshop. It often corrects the problem. If not try a different angle. QUALIFICATIONS! I’m 67 years old, semi-retired, and live in Los Angeles. I grew up in Pittsburgh and visited Kennywood Park during annual school picnics as a child in the 1950s My grandfather owned a travelling carnival and my parents would take me to visit it when he was in town. Having a severe fear of height when I was 5 years old, I screamed when his Ferris Wheel began to turn, until they reversed it and took me off the ride. I didn’t have the nerve to ride my first roller coaster until I was 14 years old (the Jack Rabbit at Kennywood). However, at my age, I find riding modern looping coasters stressful, but I do ride all of the roller coasters at Disneyland / California Adventure since I'm a season pass holder. I received two mechanical engineering degrees from Rensselaer Polytechnic Institute in Troy NY, and planned to design industrial robots or amusement park rides when I graduated. But a deal with my draft board to avoid the Vietnam War placed me in California’s aerospace industry in 1969 as a rocket scientist. After four aerospace layoffs with long periods between jobs, I changed careers. I worked as a photographer for several years, started a postcard company in 1979 to promote my work, and with too much free time designed computer games and wrote several programing textbooks on arcade game design in the early 1980s. I was forced out of the computer game consulting business when I passed the age of 40 in 1986.
since I have written an unpublished Coney Island book with a 450 page text. Adding hundreds of photos and maps will make it a very big book. Finding a publisher has been difficult because every publisher I submitted it to wants to publish a thin picture book with no more than 5000 word text. My best hope is a university press within 100 miles of the resort. The book describes all the attractions at Coney Island and how the rides work, besides covering the usual history of the famous resort. It will have a dozen 3D aerial perspective maps that show the layout of Coney Island’s three main amusement parks including the interior of Steeplechase’s Pavilion of Fun, and I am looking for additional photos of attractions to illustrate the book.